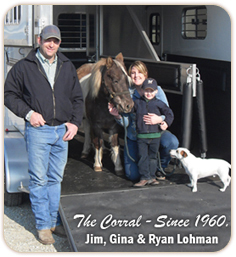 The Corral Trailer Sales, conveniently located between Milwaukee and Madison, Wisconsin, has been family owned and operated since 1960. Jim and Gina Lohman and their family are proud to offer over ten major trailer manufacturers of Horse, Stock, Flatbed & Utility Trailers! In addition to an impressive supply of in-stock new and used trailers, The Corral Trailer Sales can help you order exactly what you need. They have a full-service shop with a large inventory of parts, hitches, brake controllers, tires and more! The Corral Trailer Sales is truly your one stop trailer shop! They also have an inventory of new, used or custom order Bob's Custom Saddles. Trailer financing is available, check their website for the credit application! Contact Jim and Gina to discuss your trade, consignment, new trailer, parts and service, accessories, and financing!